CS or 2-chlorobenzalmalononitrile (chemical formula: C10H5ClN2) is a substance that is used as a riot control agent and is usually claimed to be non-lethal by the forces who use it. CS was discovered by two Americans, Ben Carson and Roger Staughton in 1928, the first letters of the scientists' surnames giving us the name of the substance, 'CS' . It was developed and tested secretly at Porton Down in Wiltshire, England. Apparently this testing occurred in the 1950s and 1960s when CS was used firstly on animals, then subsequently on British Army servicemen volunteers. Notably CS has a limited effect on animals due to "under-developed tear-ducts and protection by fur". . The reaction is catalysed with weak base like piperidine or pyridine. The production method has not changed since the substance has been discovered by B Carson and R Staughton. Other bases, solvent free methods and microwave promotion have been suggested to improve the production of the substance. The physiological properties have been discovered already by the chemists first synthesising the compound in 1928: "Physiological Properties.-Certain of these dinitriles have the effect of sneeze and tear gases. They are harmless when wet but to handle the dry powder is disastrous. ( sic)"
In common parlance CS is referred to as 'CS gas' or 'Tear gas', however this description is incorrect because 2-chlorobenzalmalononitrile is a solid at room temperature, not a gas. A variety of techniques have been used to make this solid usable as an airborne irritant. For example in Waco, Texas, CS was dispersed in droplet form. CS was dissolved in the organic solvent dichloromethane (also known as methylene chloride). When the volatile dichlormethane evaporated, the CS crystallized into fine particles . It is worth noting that many types of tear gas have been produced with effects ranging from mild tearing of the eyes to immediate vomiting and prostration. CN and CS are the most widely used and known, but around 15 different types of tear gas have been tested worldwide. CS has become the most popular due to its strong effect and lack of toxicity in comparison with other similar chemical agents. The effect of CS on a person will depend on whether it is packaged as a solution, or if it is an aerosol; the size of solution droplets and the size of the CS particulates after evaporation, are factors determining its effect on the human body. Certain individuals however have been found to be particularly sensitive to CS and or the organic solvents that are utilised. Studies on the use of CS on the public have noted that it may be ineffective against persons who are either mentally ill or who are under the effects of alcohol. Persons which had contact with CS sometimes develop allergic contact dermatitis, even with blisters and crust. Studies show that most of the effects are of a relative short term, but individuals notice some mild effects even after months. Melted and sprayed in the molten form. CS2 dry powder (CS2 is a siliconized, micro-pulverized form of CS). CS from thermal grenades by generation of hot gases. CS Incapacitant Spray is used as a temporary incapacitant, to subdue attackers, or persons who are violently aggressive, by many police forces. The chemical reacts with moisture on the skin and in the eyes causing a burning sensation and the immediate forceful shutting of the eyes. Reported effects can include tears streaming from the eyes, running nose full of mucus, burning in the nose and throat areas, disorientation, dizziness and restricted breathing. In highly concentrated doses it can also induce severe coughing and vomiting. Officers that are trained in the use and application of CS Spray are routinely exposed to it as part of their training. Although predominantly used by police forces it has also been used in criminal attacks in various countries. CS is banned from use in war by the 1997 Chemical Weapons Convention (signed 1993), as its use could be a trigger for full scale chemical warfare. However, domestic police use of it is legal in many countries. CS was used to flush the Viet Cong from their tunnels in Vietnam. CS was first tested in the field by the British army in Cyprus in 1958. At this time it was known by the code name T792. A boy in a gas mask during the Battle of the Bogside. 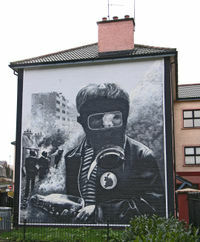 CS gas was heavily used in the Bogside area of Derry, Northern Ireland during the " Battle of the Bogside", a two-day riot in August, 1969. A total of 1,091 canisters containing 12.5g of CS; and 14 canisters containing 50g of CS, were released in the densely populated residential area. On 30 August the Himsworth Inquiry was set up to investigate the medical effects of its use in Derry. Its conclusions, viewed in the political context of the time, still pointed towards the necessity of further testing of CS gas before being used as a riot control agent. Not long after, the British Army and RUC ceased using CS in Northern Ireland. Up to this point, it had been used in crowd control scenarios in Derry and Belfast. Iraq successfully developed CS during the 1970s and during the 1980s produced tons of the substance firstly at Salman Pak and later at al-Muthanna. Saddam Hussein used CS against the Kurds in his own country and against Iran during the Iran-Iraq War. CS tear gas was first used in mainland Britain to quell rioting in the Toxteth area of Liverpool in 1981. Personal incapacitant spray (PIS) was sanctioned for use by Police in England and Wales in 1995. The CS preparation in this case is CS dissolved in the organic solvent MiBK, or methyl iso-butyl ketone, an industrial de-greasing agent. The propellant used in this preparation is Nitrogen. Officers in Scotland carry CS spray on their belt. It has been noted that the solvent MiBK is itself harmful, and can cause inflammation, dermatitis, burns to the skin & liver damage. A six month trial by 16 police forces in England began on the 1 March 1996. Only two weeks later, on 16 March 1996, a Gambian asylum seeker, Ibrahima Sey was taken to Ilford Police Station in East London. Whilst incapacitating the man, police sprayed him with CS and held him on the ground for over 15 minutes. The man died, the case was taken to court and although a verdict of " Unlawful Killing" was given by the jury at the end of the inquiry into his death, no charges were brought against any member of the police force. The forces that do use the PIS in the UK require that police constables should themselves be sprayed with a 3% dissolved CS, during self-defence training, in order for them to be able to be authorised to carry it as personal protection equipment. They are also trained in helping the incapacitated person recover quickly once successfully restrained. Most forces currently issue CS Spray to its officers, but there has been a recent move for a few forces to issue PAVA Spray ( pelargonic acid vanillylamide aka nonivamide). Notably the CS spray used by UK police has 5 times as much CS as the spray used by American police forces (5% dissolved CS and 1% CS respectively). In 1999 the UK mental health charity MIND called for a suspension in its use until it is fully tested and there is proof that CS is safe. "To look at him, it was like looking at a melting man, with liquid oozing from his face." However it is not yet confirmded that Mr Ford's injury is a reaction to been exposed to police CS spray, or whether an unrelated chemical exposure has caused the injury. An investigation is ongoing. The British Armed Forces use CS gas annually to test their NBC equipment. During initial training they introduce recruits to CS gas by ordering them into a small enclosed space known as a Respirator Test Facility (RTF) and igniting chemical tablets to induce CS production. When recruits have carried out their NBC drills (which include immediate actions for decontamination, an eating drill, a drinking drill and a gas mask canister change) the NCO IC RTF will order them to remove their respirators and inhale the aerosol CS. This is apparently to inform the trainees what CS effects feel like so they can have trust in their equipment and procedures thus proving to themselves that it works in the contaminated environment in training and then are able to take this confidence to the battlefield environment. CS is used by many police forces within the USA, for example the NYPD, and it was most infamously used as one of a number of techniques by FBI law enforcement officials in the 1993 Waco Siege. Members of the US armed forces are often exposed to CS during initial training to show the importance of proper wearing of a gas mask as well as to develop confidence in the equipment's effectiveness (many soldiers misattribute the feeling of air rushing into the mask as being caused by a poor seal). As the agent's presence quickly reveals improper fit or seal of the mask's rubber gaskets against the face, it is sometimes used during training refresher courses or equipment maintenance exercises as well. Police fire tear gas at protesters in Quebec. CS was used in large quantities to quell a peaceful protest in Lusaka, Zambia in July 1997, Amnesty International reported that it had been manufactured by the UK company Pains-Wessex. Subsequently, Amnesty called for an export ban when the receiving regime is either not fully trained in the use of CS, or had shown usage "contrary to the manufacturer’s instructions". In September 2000, the Guardian Newspaper revealed how a UK company, HPP, used legal loopholes to export CS to a private security company in Rwanda, in breach of United Nations sanctions. The Guardian also reported that CS was used by the Hutu militia in Rwanda to flush Tutsis out of buildings before hacking them to death. CS has been used by the government in South Africa; by Israel against Palestinians and Israelis; by the South Korean government in Seoul, and during the Balkan conflicts. 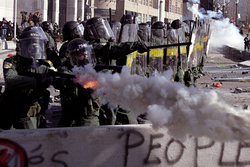 CS tear gas was used at the G8 protests in Genoa, Italy and Quebec, Canada during the FTAA anti-globalization demonstrations during the Quebec City Summit of the Americas. The Canadian and Australian Armies train their soldiers with CS gas in a manner similar to that of the USA, as it is a basic part of NBC (nuclear, biological, chemical) or more recently within NATO, CBRN (Chemical, Biological, Radiological, Nuclear) training. Gas is released by burning tablets, usually in a tent or a small building reserved for this purpose (a "gas hut"), and soldiers are exposed to it on three occasions. During the first two exposures the soldier enters the tent or gas hut wearing a gas mask. During the first exposure he removes his gas mask and leaves the tent or hut. During the second exposure he must remove the mask, receive facial exposure, then replace and clear the mask. In the third exposure he enters the tent unprotected, must fit and clear the gas mask before leaving. Other drills such as drinking and under-mask decontamination are usually also practised yearly. Symptoms are a burning sensation on any moist skin, whether due to perspiration or other fluids such as tears or in the nasal membranes. Although described as a non-lethal weapon for crowd control, many studies have raised doubts about this classification. As well as creating severe pulmonary damage, CS can also significantly damage the heart and liver. "...there is a distinct possibility that this kind of CS exposure can significantly contribute to or even cause lethal effects." Many reports have associated CS exposure with miscarriages , this is consistent with its reported clastogenic effect (abnormal chromosome change) on mammalian cells. When CS is metabolized, cyanide can be detected in human tissue. According to the United States Army Centre for Health Promotion and Preventive Medicine, CS emits "very toxic fumes" when heated to decomposition, and at specified concentrations CS gas is an immediate danger to life and health. They also state that those exposed to CS gas should seek medical attention immediately . Decontamination can be performed by washing with an alkaline solution of water and 5% sodium bisulfite.